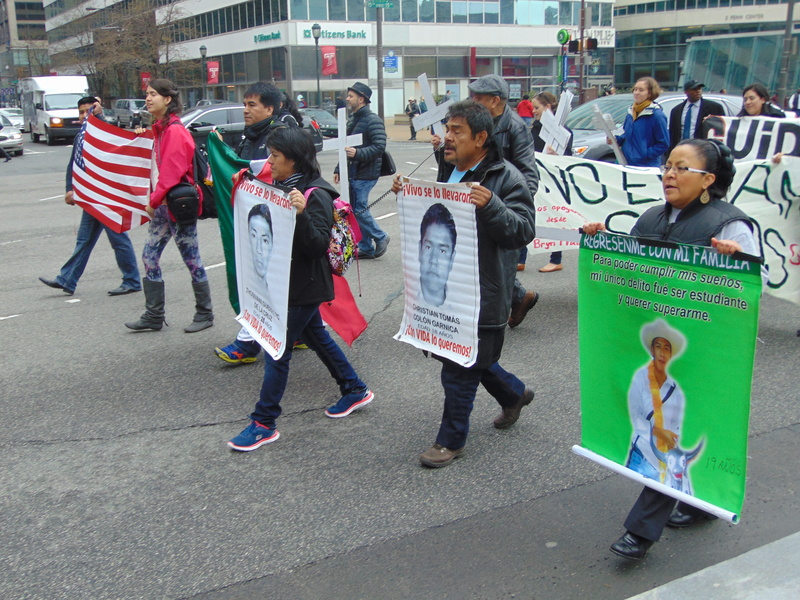 Families of Ayotzinapa 43 march from Love Park to Philadelphia’s Mexican Consulate. Philadelphia – Iguala. The small Mexican town of a little more than 128,000, in Guerrero, Mexico, has for the last seven months elicited the type of outraged demonstrations that can be likened to those north of the border in North Charleston, S.C. Ferguson, Mo. Likewise, the names of Cristian Tomas Colon, Joshvani Guerrero de La Cruz, Bernardo Flores, Jose Campos, Carlos Hernandez or Jorge Alvarez and the other Ayotzinapa students are victims of an indiscriminate violence comparable to that which occurred to Eric Garner and Walter Scott here. The sketchy details of what happened to these -largely indigenous- students last September, has so far produced arrests of Iguala’s Mayor and Police Chief. On September 26th, the 43 missing Ayotzinapa students, ages 18 to 20 – all students at the Raul Isidoro Burgos Teachers College in Ayotzinapa – took a trip to the city of Iguala to protest for changes in government policies. According to preliminary findings of an investigation, local Iguala police sought to suppress the student demonstration and were met with mild resistance, prompting officers to shoot two students. As part of a international effort to bring attention to the disappearance, “Caravana 43,” a group of the parents and families of the 43 missing Ayotzinapa college students toured Philadelphia this weekend. The families are calling attention to the lack openness and justice in the Mexican government’s investigation of the disappearance of the students. The group is also demanding an end to the United States financial support for Mexico’s law enforcement. “The Mexican government is killing our people,” declared Carmen Guerrero, an immigrant advocate from Norristown, who led the group on a march from Love Park to the Mexican Consulate at 5th and Market Sts. Ms. Guerrero called specifically on the U.S. to reconsider its Merida Initiative, a bilateral agreement which has provided financial support of up to $2.3 billion since 2007, largely dedicated to Mexico’s law enforcement in its fight against drug trafficking. Another sign indicated discontent with Mexican President Enrique Pena Nieto, with a skull beside the name Pena. Besides marching through center city, the “Caravana 43” appeared in Philadelphia’s City Council Chambers, at the Fleisher Institute, University of Penn’s Casa Latina and at Haverford College. A resolution of solidarity with the families of the 43 missing students, sponsored by Councilwoman Maria Quinones Sanchez, was unanimously approved in City Council. “I don’t know if there is anything that can be done here, like applying pressure through the United States on the Mexican government,” said Federico Santoyo, who along with his mother,were part of the Mexican-American community that greeted the visiting Ayotzinapa families. Marlina Santoyo, Federico’s mother, disagreed: “The United States should stop giving arms to those involved in narcotics trafficking and violence. All we’re doing is supporting the arms manufacturing businesses in this country” and creating a “coercive” military presence in Mexico. “What we’re doing -in the United States- is just supporting bad governance,” added Federico Santoyo. “We want them back alive,” said Ms. Guerrero as they began the Love Park rally. The Ayotzinapa 43 group in late March met with U.S. Rep. Luis Gutierrez and the Hispanic Congressional Caucus, but no official statements followed the meeting. El Hispano also questioned U.S. Sen. Bob Casey (D-Pa.) on the issue. Sen. Casey, who until this year had been a member of the Senate Foreign Affairs Committee, conceded he has “heard nothing” on the issue in the Senate. 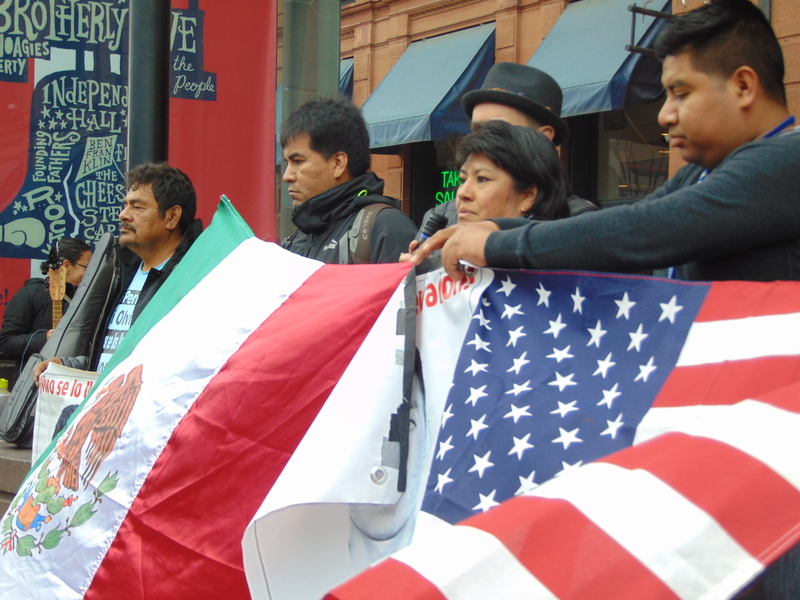 The Network of Immigrants United For Mexico (RIUM), a coalition of immigrant affiliated groups and allies provided support and guidance for the Ayotzinapa 43 families in their journey across the United States.